WASHINGTON (Reuters) - The U.S. Supreme Court on Tuesday curbed the ability of immigrants held in long-term detention during deportation proceedings to argue for their release in a ruling in sync with President Donald Trump’s get-tough approach toward immigration. The court’s conservative justices carried the day in the 5-3 decision that overturned a lower court’s ruling that required that immigrants held by the U.S. government awaiting the outcome of deportation proceedings get a bond hearing after six months of detention to seek their release. The ruling could lead to indefinite detentions of certain classes of immigrants, including some with legal status who the government wants to deport. The court’s five conservatives were in the majority in the ruling written by Justice Samuel Alito. Three liberals dissented, including Justice Stephen Breyer, who sharply criticized the decision. Another liberal, Justice Elena Kagan, did not participate. Class action litigation brought by the American Civil Liberties Union challenged the government’s practice of placing immigrants facing deportation proceedings in detention for months or years without being able to argue for release. Breyer said that forbidding bail would likely violate the U.S. Constitution’s guarantee of due process under the law. Breyer said he doubted the U.S. Congress, in crafting the immigration provisions at issue, would have wanted to put thousands of people at risk of lengthy confinement without any hope of bail. “We need only recall the words of the Declaration of Independence, in particular its insistence that all men and women have ‘certain unalienable Rights,’ and that among them is the right to ‘Liberty,'” Breyer wrote. The case assumed added importance in light of the Trump administration’s decision to ramp up immigration enforcement, with growing numbers of people likely to end up in detention awaiting deportation. The court threw out a 2015 decision by the San Francisco-based 9th U.S. Circuit Court of Appeals that the government must provide bond hearings to gauge danger and flight risk when detention exceeds six months, and every six months after that. Former President Barack Obama’s Justice Department had challenged that ruling. The Trump administration took up the appeal. Justice Department spokesman Devin O‘Malley said the 9th Circuit’s ruling had resulted in unnecessary bond hearings, adding to a backlog in the immigration court system. “We are aggressively working to implement common sense reforms to reduce that backlog, and today’s Supreme Court decision ensures that immigration judges in the Ninth Circuit can focus their valuable docket time on matters actually required by law,” O‘Malley said. The justices sent the case back to the 9th Circuit to consider the question of whether the Constitution requires bond hearings for detained immigrants. The ACLU said it looks forward to arguing the constitutional questions in lower courts. “The Trump administration is trying to expand immigration detention to record-breaking levels as part of its crackdown on immigrant communities,” ACLU attorney Ahilan Arulanantham said. 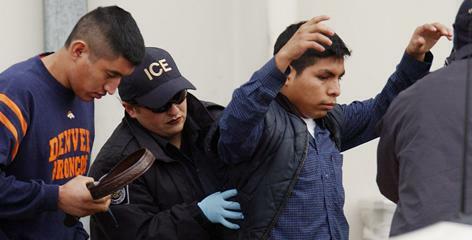 There are roughly 36,000 immigrants held in detention in the United States on any given day, and the ACLU estimates that about 10 to 20 percent have been detained at least six months. Those suing included immigrants who were held at the border when seeking illegal entry as well as others, including lawful permanent residents who hold so-called green cards, who have been convicted of crimes. The lead plaintiff was Alejandro Rodriguez, a legal immigrant from Mexico living in California who was brought to the United States as a baby. He was working as a dental assistant when he was detained for three years without a hearing after being placed in deportation proceedings based on two non-violent convictions, joyriding and misdemeanor drug possession. Although Rodriguez was released eventually, the case brought on his behalf continued. In dissent, Breyer said that asylum seekers or non-citizens who arrive at the U.S. border still have due process rights. “We cannot here engage in this legal fiction,” Breyer wrote. This marked the second time the high court considered the case. It ordered a new round of arguments after Trump’s conservative appointee Neil Gorsuch joined the bench last year.